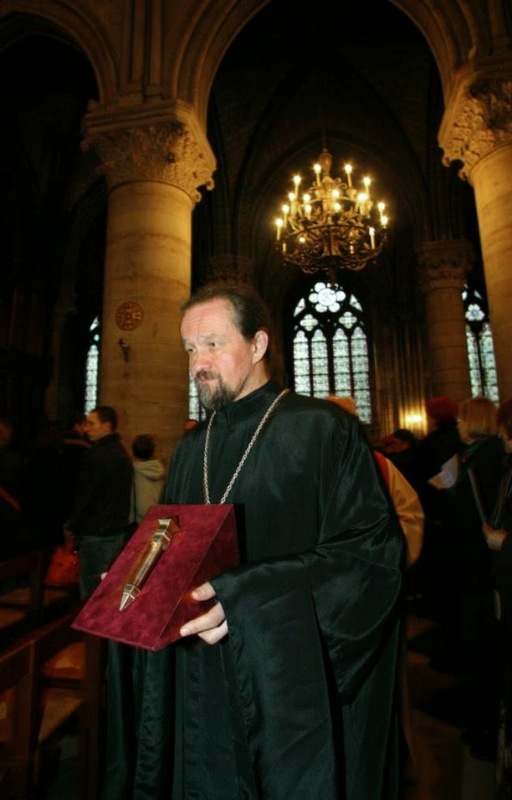 The Treasure of the Cathédrale Notre-Dame was for a long period of time one of the richest in France. Then the French Revolution happens in 1789. Everything collapse, the revolutionary government abolishes the clergy and its privileges. The churches, the convents and the monasteries are robed of their treasures. Every parcel of valuable good is sold, melted or reused. Those treasures are completely emptied. Many years later, the Cathédrale Notre-Dame begins to receive again legacies, to commission masterpieces, in fact, to rebuild from scratch its treasure. Nowadays, for special events, the Mass is still celebrated with ciboriums and cups set with precious stones. 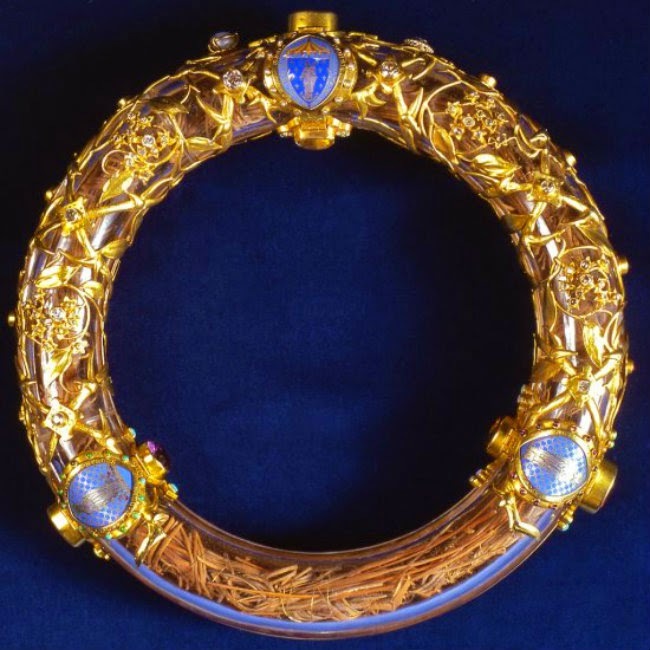 But even more precious than this goldsmith work are the Holy Relics: the Christ's Crown of Thorns, a nail from the Christ's cross and a piece of wood from the crucifixion. 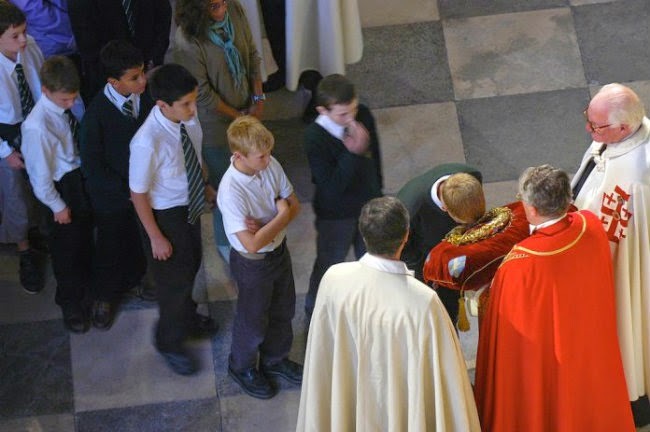 Every first Friday of the month, at 3:00, a Mass is celebrated and the worshipers can kiss and touch the Holy Relics. The solemn ceremony includes twenty men and women clothed in long white capes, for men, and in long blue capes, for the women. The Holy Relics are set up on cushions. A crystal glass tube, circled with gold, contains the Holy Crown of Thorns. The tube shape hugs the Crown shape. The Holy Relics were acquired in 1239 by Louis the IX of France (this king was eventually canonized and became St-Louis). At the time, he spent a gigantic fortune to acquire them. But in 1789, for the Revolutionaries, those objects were completely worthless! The Man’s silliness or the Divine intervention saved them through the centuries. 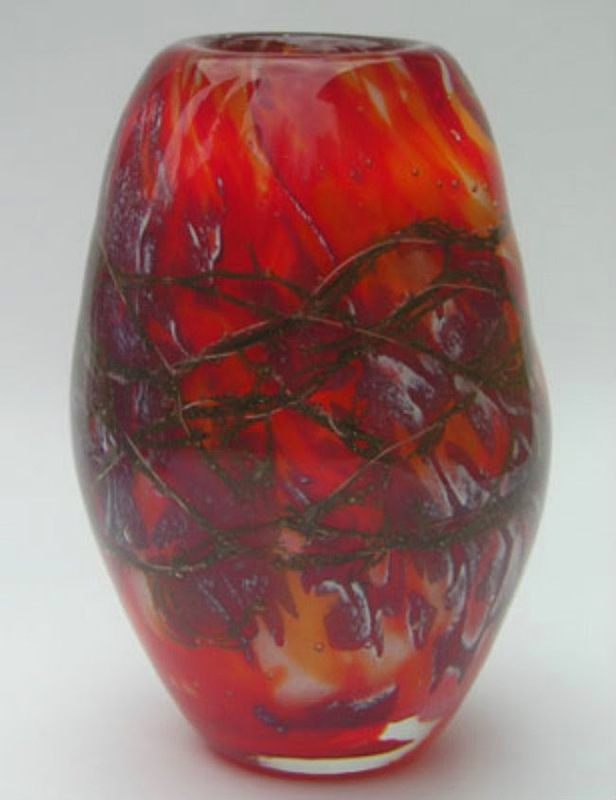 At the beginning of her career, Madame Sauvalle was a glassblower. But in the recent years, she had to let go this aspect of her profession. It has become physically to demanding. 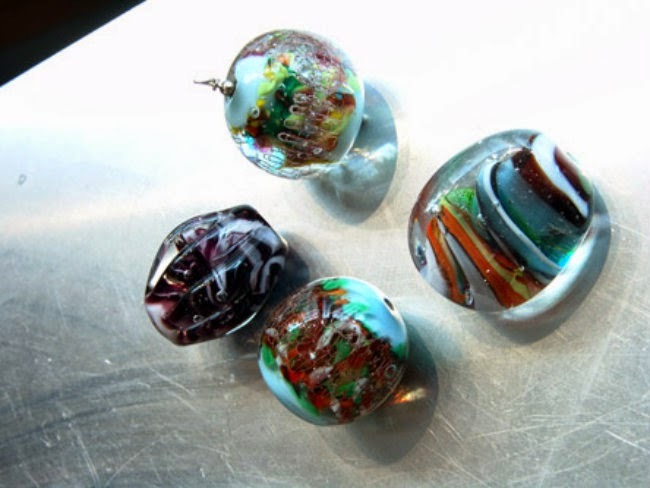 The glass blowing takes physical strength for handling the sticks loaded with melted glass. 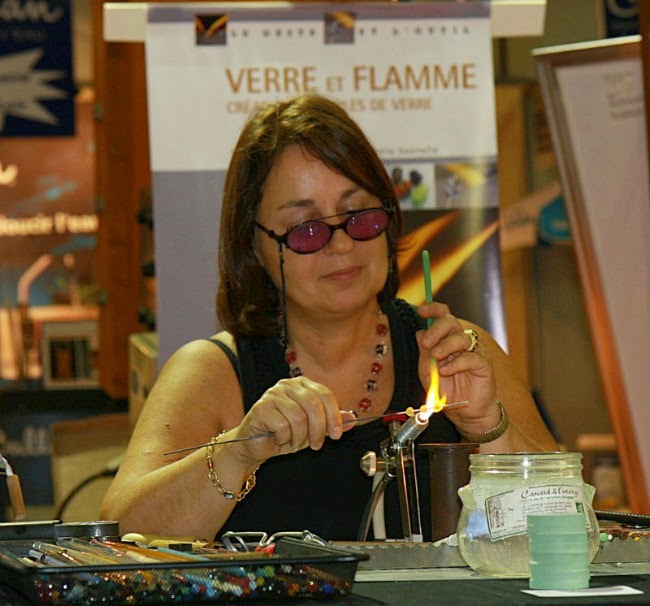 Therefore, Michèle Sauvalle continued her glass handicraft with the torch technique. Now, she creates glass pearls. 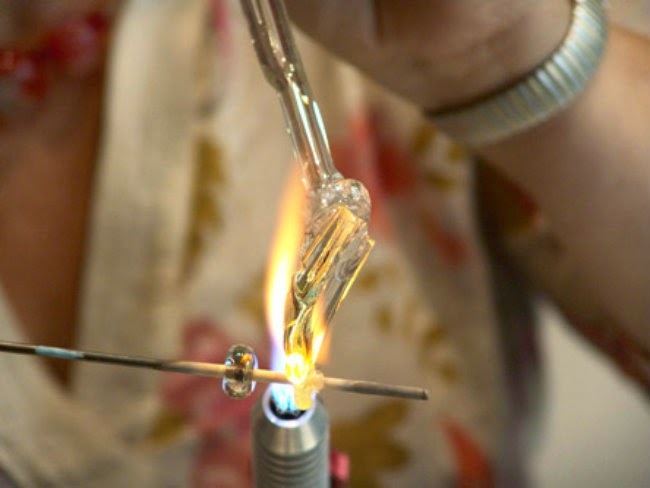 The prettiest ones are made following the "latticino" technique, meaning: twisted glass wires. Michèle likes to work with artisans from other Art disciplines. Collaborating with them, allows her the integration of her glass pearls in sculptures, lamps, artistic montage, in precious ornament of decor or to create jewelry with goldsmiths. Madame Sauvalle works also at translation, a useful profession for her financial security. This way, her peace of mind gives her more freedom for creation. In addition of those occupations, she teaches. She adores having students and sharing her knowledge of glass work. Mathilde is one of my friends. 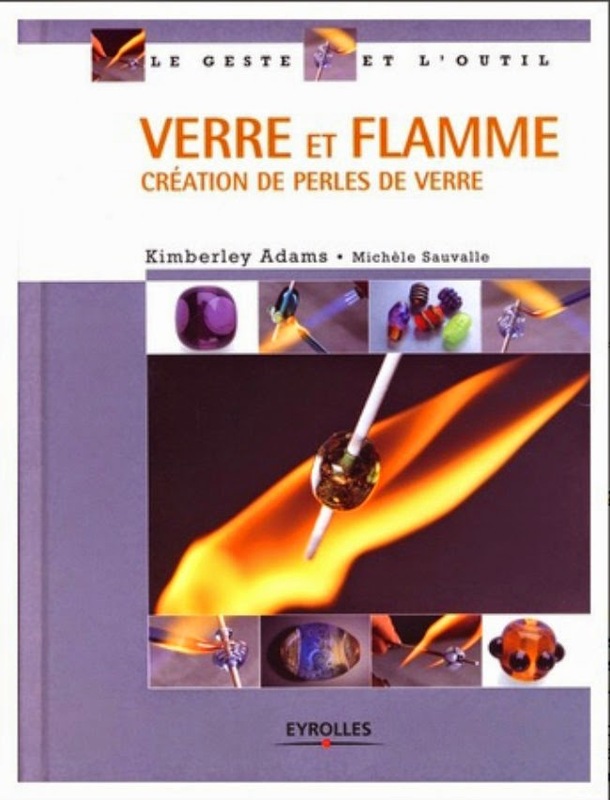 I first met her at the beginning of an exhibition in France, to which we take part with our artistic works of embroidery: Les mini-textiles du Musée d’Angers. This is a 3 year touring exhibition travelling through some European countries and also to the province of Quebec. At the present day, our artistic works still continue to travel. Mathilde welcomes me home, after her day of work. Where does she work? At the prestigious Haute Couture workshop Lesage, the best place in town. When I say “the best place” I certainly don’t refer to the workers’ conditions. 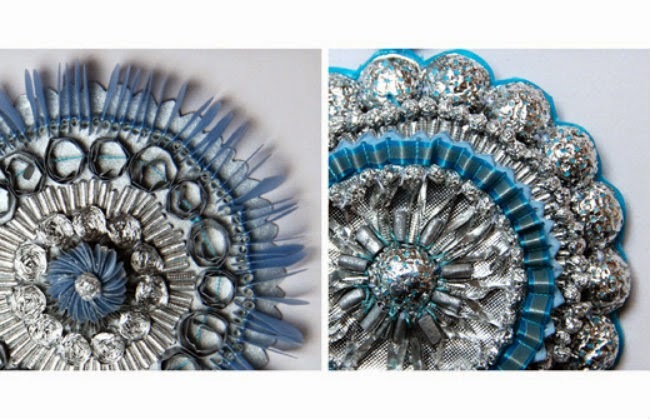 But Lesage has assuredly a reputation of high class in the Haute Couture business. At Lesage’s there are many professional levels to progress in the embroiderers’ hierarchy. There are short period part time jobs and regular full time jobs. Mathilde has progressed up to the level of design draftsperson, meaning she traces the designs onto the fabric, at the exact location, where the embroiderers will eventually stitch them. Mathilde would like a lot embroidering her own creations. But where to find the necessary time to stitch, if one is exhausted after a long day of work? I love the glasswork and the necklace. They're so beautiful.